Rockstar Games is known for being a meticulous developer. A slave to the details, their desire to create the most realistic sandboxes possible has led to some great games. Red Dead Redemption 2 could be considered the culmination of Rockstar’s past efforts; they’ve created one of the most authentic western experiences found in a video game. Unfortunately, this doesn’t necessarily make RDR2 the amazing game everyone hoped it would be. As the prequel to the first Red Dead Redemption, RDR2 follows the exploits of the Dutch van der Linde gang. They were apparently notorious for their crimes; they made a good living robbing and conning folk. Their way of life wasn’t sustainable however. Thanks to a shift in attitudes (and the cracking down on lawlessness), the wild wild west era was coming to an end. This truth was burned into Dutch’s psyche after his gang fails to rob a ferry in the fictional town of Blackwater. The botched heist turns their lives upside down, forcing them to flee encroaching lawmen into unknown territory. The trip is perilous to say the least. Heading east, the gang and their collective families travel across a mountainous region amid a blizzard. Some of them are lost to the cold. Others are attacked by wild animals. Most of them make it to the other side though, thanks to Dutch and his right-hand man (the game’s main protagonist), Arthur Morgan. 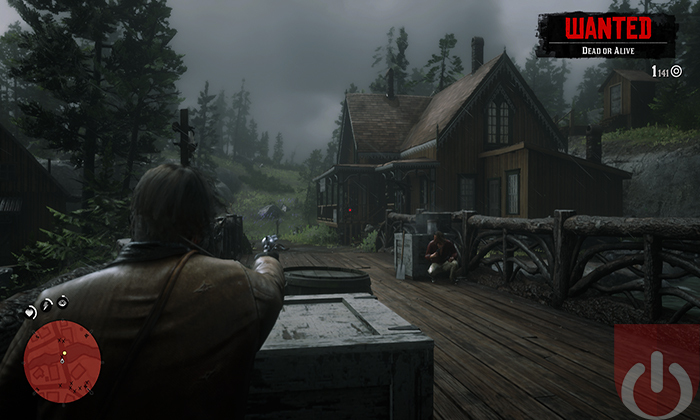 With the mountains to their backs, Arthur and co. are able to set up camp a few miles west of a town called Valentine. Dutch, hoping to secure enough funds to buy safe travel out of the country, orders the gang to scare up some dough. The women were to con men out of their money or to ease drop on conversations to gather information while the men canvas the scene for more notable opportunities. Thanks to the news of their explosive departure from Blackwater making its way to Valentine, it didn’t take long before the group’s activities drew some unwanted attention. I won’t go into what happens next, only to say that Dutch’s plans for a brighter future leads to turmoil amongst the gang. The main concern being that they needed to keep a low profile. Later on, the desire to stay safe replaced this concern, to the point where they were willing to forgo the money and the settling of scores. The tension mounts as select individuals within the gang start to question Dutch’s leadership. Arthur lends his voice as well, arguing that their current trajectory is only going to get everyone killed. RDR2 is full of captivating characters and engaging dialogue. Arthur’s plight is interesting on paper. The drama created by him trying to balance being loyal to his friend and being the voice of reason is exciting at times. There’s also a decent amount of action – bank heists, shoot outs, jail breaks and so on – that help to raise the stakes of each encounter. Essentially, the game has all the bells and whistles one would assume is needed to produce an unforgettable story. Or, at the very least, create one that could keep the player invested until the credits rolled. That’s not the case here. Things start off well enough. 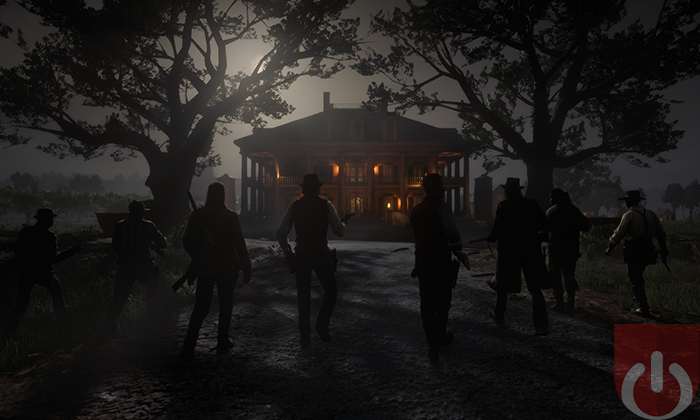 With the first two chapters acting as the game’s tutorial, the events that would eventually lead to dissension amongst members of Dutch’s gang are slow to manifest. This isn’t really an issue at first as the potential for some meaningful developments seem to be a few missions away. At some point, one of these characters is going to grow tired of Dutch’s “one last job” speeches and try to take him down. There’s bound to be a twist or some sort of major event that dramatically changes the group’s dynamic. Sadly, this pivotal event doesn’t occur in a timely fashion. Seemingly content with going through the motions, the major characters refuse to move beyond their words. This includes the player (as Arthur) who’s forced to be a part of Dutch’s foolhardy schemes. He’ll doubt him, condemn an ally’s reckless behavior, even be on the verge of trading fists with his fellow criminals. But the game doesn’t allow Arthur or anyone else to act on these thoughts for most of the game. In other words, the player will spend hours upon hours participating in fruitless endeavors and pointless firefights. With the absence of a central villain, the redundancy of the plot is made worse.. That’s not to say that there weren’t any characters vying for this position. There is a rival gang leader that evokes a ton of hatred from the cast, a wealthy businessman who has the unfortunate luck of being robbed by Arthur, and an few abrasive agents from a detective agency that fantasize about killing the prominent figures in Dutch’s gang. Sure, they act as catalysts for a plan going south or some other calamity, but none of them are on screen long enough to be cared about. One of them is only seen once – offering a minor contribution to the story despite how he was built up as a threat prior to the encounter. Other characters step into the spotlight in opposition of the player over the course of the game, only to be done away with a few missions later. Some are rather charismatic; a certain Italian crime lord (seemingly inspired by a different time period) clashes violently with that of Arthur’s group. All of them feel wasted in the grand scheme of things. To a degree, the decision to focus solely on Arthur, Dutch and the other gang members is sound. Get the player to spend as much time with these characters as possible. That way, they’ll better appreciate the game’s real dilemmas – that being the unraveling of Dutch’s makeshift family. This premise works well during the final chapters. After all of the crap these characters put each other through, it’s cathartic to see them resolve their issues. One of the problems with this set up (going back to what I mentioned earlier) was how long it took to get to that point. While I wouldn’t say that the early parts of the RDR2 are boring, large portions of the game felt unnecessary in framing this story. The other problem had to do with Rockstar banking on the player to build relationships with each gang member. Even though I spent a decent amount of time chatting with these characters, going on side missions and such, my desire to finish the game meant I wasn’t willing to buddy up with everyone – most players aren’t going to take the time to know every single side character on some deep level. Some of them weren’t even available to befriend on that that way. Because of this, scenes depicting the demise of said characters fell flat; I didn’t even remember some of their names, let alone care that something bad had happened to them. RDR2’s story has some good parts. That said, large segments felt tedious. The same can be said of the moment to moment gameplay. I enjoyed jumping onto moving trains, cracking the safes during a bank job, sneaking into caves to subdue a group of cannibals and successfully conning an arrogant tycoon during a high stakes poker game. Some of the side activities/mini-games were also fun – it’s cool that you can hop in a boat and go fishing with one of Arthur’s friends, hunt animals to craft items, and basically live in this world. Playing as Arthur Morgan (and pretending to be a cowboy in general) can be wildly entertaining. 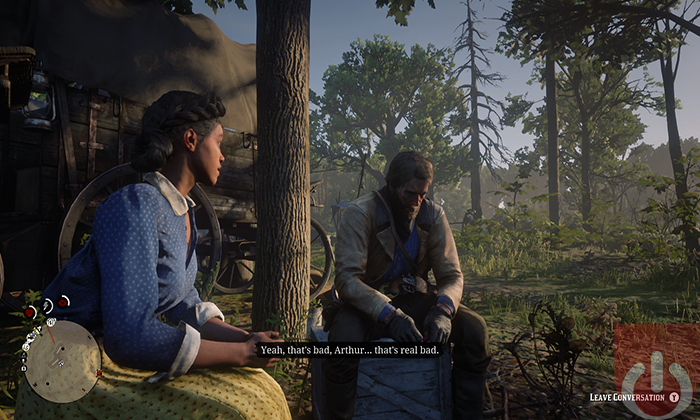 My issue here is that most of the story missions end the same way: with a large shootout or Arthur and company fleeing on horseback…after a large shootout. Even when the mission doesn’t call for killing, somehow you’ll still end up decimating a town’s worth of enemies. Part of the allure of a heist is the ability to pull it off scot-free. RDR2 robs the player of this satisfaction (pun intended). Worst still, these missions seem trivial when the story makes you do them over and over and the outcome is essentially the same each time. Again, the game felt tedious. 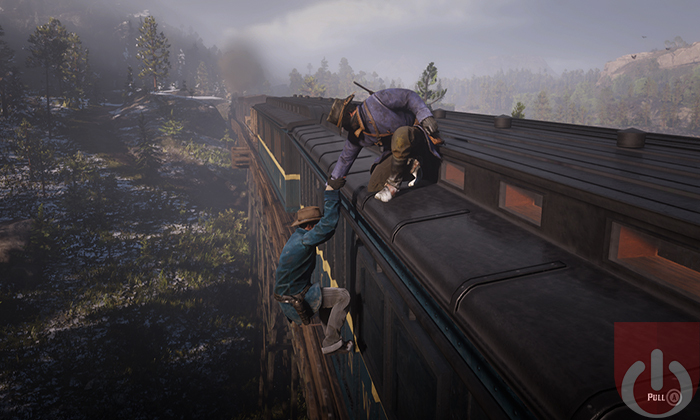 Most of everything else about RDR2 is great. This is especially true when it comes to the game’s visuals. 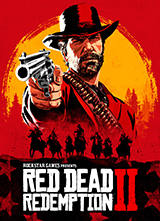 Whether it’s the snow-covered mountains seen in the distance, an alligator infested swamp on the outskirts of a shanty town, or the various dusty trails that splinter at the edge of a dense forest, RDR2 presents it all in top form. Being able to showcase a beautiful vista in real time is old hat for Rockstar. They’ve outdone themselves, however, when it comes to the finer details. They included an entire ecosystem that reacts realistically to world around them; animal placement and behaviors change over time, not just in reaction to the player’s actions. The landscape is altered visually as a setting sun blankets a familiar location with new hues. Even the change of weather is dramatic. The wind will pick up as storm clouds roll into a region. NPCs will note the change in weather, some will even seek shelter. All of this happens before the rain comes. During the storm, the roads will get muddy causing a person’s boots to sink into the ground. The details bleed into the gameplay as well. The roads will stay muddy after it stops raining. It’s then possible to fall – perhaps, during a tussle with the town drunk – and get covered in mud, resulting in rude comments from nearby NPCs. When committing a crime, it’s best to wear a mask to make it difficult to be identified by passing lawmen later on. If things do go bad, a quick shave, hair cut and change of clothes can help keep them off your back. Just note that it’ll take time to grow all of that hair back. Good or bad, your reputation will grow to impact the world around you. Rescue a postman from a bear trap and he’ll sing your praises the next time he sees you. Even more interesting, if you happen upon him while he’s talking to a friend (without him seeing you), he’ll recount the tail to them. While this occurrence isn’t a coincidence – the game meant for you to find him again – the illusion of this character’s existence beyond the confines of your particular adventure is a nice touch. There is so much more to talk about when it comes to Red Dead Redemption 2. The bottom line is that it’s a technical marvel that easily outperforms every other open world game on the market when it comes to the finer details. Where gorgeous visuals can be experienced from a third and/or first-person view, and the gaming systems combine with realistic physics help to create a more believable world. It sports a brilliant cast of characters, well written dialogue and over-the-top action that most fans of the series will enjoy. It even has a wonderful musical score that’s primarily composed by Woody Jackson; the music featured in the final chapters is just amazing. While this is great and all, the game does suffer in the story department. Feeling bloated, as if the experience was padded to extend the play time, Red Dead’s six chapters and obsessively long epilogue overstay their welcome. As a result, the bombastic gameplay becomes tedious and is only saved by the later chapters and the nonessential content – like hunting and such. Playing as Arthur Morgan can be fun as RDR2’s world is filled with entertaining diversions. The story unfortunately drags on for way too long and much of the main content felt tedious in nature. That said, the latter chapters are worth playing, if only to justify the hours of spent getting to them. RDR2 is easily one of the best-looking games on the market. Rockstar has really outdone themselves. Everything from the dialogue to the music is outstanding. I have no desire to play through the campaign a second time. 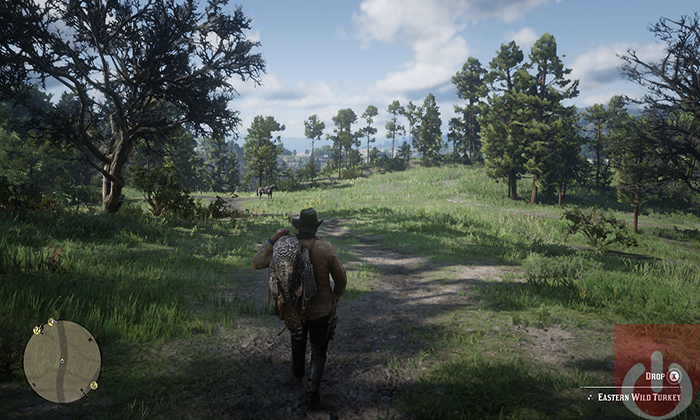 However, I can see people going back to replay the missions they enjoyed, to hunt down legendary animals, or to just mess around in Red Dead’s world.